A bit like MK Dons, it is recommended to book official car parking in advance as there is no street parking within a 20 minute walk of the stadium. Decided to bite the bullet and pay the car parking charge - ouch! Well that wasn't very good. First time I've seen us in the flesh for a while, and it seems like the team is low on confidence and morale. We looked like the team at the bottom of the league, not Coventry. First half was absolutely dreadful. Coventry had far too much space in which to play, we never closed them down, whereas the Sky Blues were in our faces from the off. When we did have the ball we barely strung two passes together. There was no movement off the ball, too many times they were all watching Maguire hoping he'd unlock Coventry by himself. We had no width and neither fullbacks provided any support down the flanks, instead they sat deep and invited pressure onto themselves. First goal was a great strike but came from us giving the ball away cheaply (again), second one was comedic in its creation; I suspect Sordell won't score an easier goal all season. Fair to say we improved in the second half but we still made too many basic errors and were far too elaborate around the penalty area. Just stick to the simple things, bodies in the box and a wide man putting it in the mixer. So players: A rare mistake from Eastwood, but otherwise another solid performance. Not impressed with Edwards, who offers nothing going forwards and prone to errors at the back. Lundstram is a shadow of last years' player. MacDonald offered absolutely nothing. Taylor is not a left winger, and I fear we've blown our dosh on Hemmings who seems way below the standard required of a League 1 striker (which is a damning indictment of the SPL). Positives - Maguire; where would we be without him? Johnson and Crowley looked bright when they came on, and Rothwell did alright but wasn't helped by the poor form of all those around him. Overall, very poor and sad for the hordes of Oxford fans that turned up and generated a bit of atmosphere in that soulless empty shell of a stadium. A very depressing evening, from the awful out of town corporate hell hole that is the "arena" and Casino to drink in, to the trains being cancelled on the day to get to such hell hole leaving those who had pre booked tickets wondering how the hell they weren't going to miss their connections back. 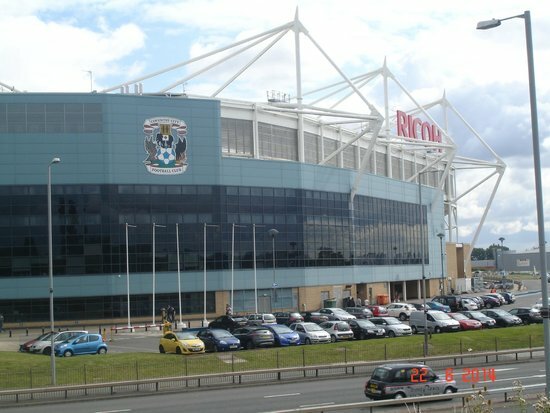 Highfield Road was a perfectly good ground and it is such a shame that a club like Coventry have been brought to their knees by moving grounds, much like we were but we at least have an owner who is willing (for now) to fund the gap created by not having our own stadium. I actually thought they were pretty decent, knocked the ball around well, knew how to make use of their huge pitch (could see why they haven't lost at home this season) and Stevenson looked much older than his age suggested, his reading of the play was something else. Agree with Shoobedoos analysis of the players with the exception of Hemmings. I thought he did ok, showed some good touches, made some good runs (was just offside when clean through) but is clearly lacking in confidence as any striker would be (well maybe not Jemmo) when in and out the side. I found it baffling that we took off Hemmings and Taylor soon after bringing Johnson on as there was no-one to get on the end of the balls into the box. I think we need to give up with trying to fit Taylor into the team, we then tend to hoof it long to him which does not suit us. Accept the fact we're going to play it on the ground and make sure we do - whacking it long to the head of Hemmings will not show him in a good light, he needs balls to feet or behind the defence to run onto, he got very little of that on Tue, we create so few chances at the moment it's so frustrating. No-one (Apps included) knows our best formation or team and I think he needs to make his mind up and stop fiddling - we did well last season when we had a settled team and it picked itself, trying Taylor out wide was never going to work long term. I would play 4-1-3-1-1, usual defence, Rothwell, then Maguire Sercs and Johnson with Crowley in behind Hemmings. We are at out best when we get players on the ball playing to feet and should play those players who are most comfortable with this which means Crowley should get a run after doing well when he comes on. We are too inconsistent at the moment. We've spent a lot of money of Hemmings and Johnson and it's time we find out whether they're up to it by giving them a run of games, if they're not it's a failing of our much vaunted scouting system. Location: Stayed at the Manor. largely agree with the previous comments. quite impressed with the coventry side who had us on the ropes from the start. appleton I assume sees lundstram as key to our play and has been hoping he'll play his way back to confidence. I lost patience on tuesday night. bit harsh on macdonald, but a poor performance in a collectively poor performance, yes. I think coventry had watched the bradford game and sussed the taylor strategy. it was rarely as successful as it had been on saturday. edwards - main thing I start to worry about is that 'steady eddie' is always there when we make a key mistake. I think we're starting to see why he's been loaned out. against wimbledon time and again he and raglan slipped up, even before we'd conceded. on tuesday night our back line was ruffels (makeshift left-back), dunkley, raglan (loan), and edwards (loan). perhaps conceding two goals is not so surprising. and I don't think that goal was eastwood's doing. I read on The Other Place that some people think eastwood didn't respond properly to where edwards indicated he was heading the ball, and sure enough when I watch the highlights edwards does point. problem is, it looks to me like he points the other side to where he actually headed the ball. I think he's a problem. anyway, somehow during that performance I found myself talked in to going to port vale. nice to see some of this board's posters there on tuesday at least, hope to see you again tomorrow. Matt D wrote: appleton I assume sees lundstram as key to our play and has been hoping he'll play his way back to confidence. I lost patience on tuesday night. I've previously commented on my lack of surprise regarding Lundstram's poor form this year, as the warning signs were there last season. What hit me on Tuesday night was just how one paced he was - that pace being "glacial". Captain or not, he deserves the shepherd's crook. problem is, it looks to me like he points the other side to where he actually headed the ball. I think he's a problem. Not only that, he headed the ball so far wide of where he should have expected the keeper to be it almost looks like an attacker trying to put it wide of the on-rushing keeper! Poor communication or not, it was a bad header anyway.